In memoriam: "Typography and bikes"
It was with sadness that I received the news that Glenn Goluska, "typographiste", recently passed away at the age of 64. 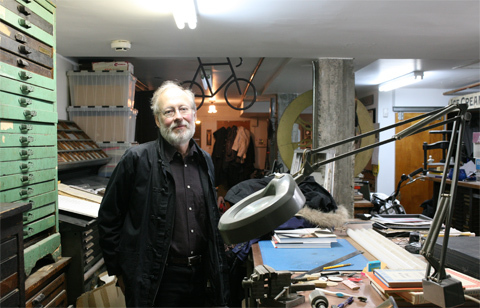 In mid-June, I had the opportunity to visit Glenn in his typography studio, located in the basement of his house in the St-Henri neighborhood of Montreal, and conduct what would be one of his last interviews. 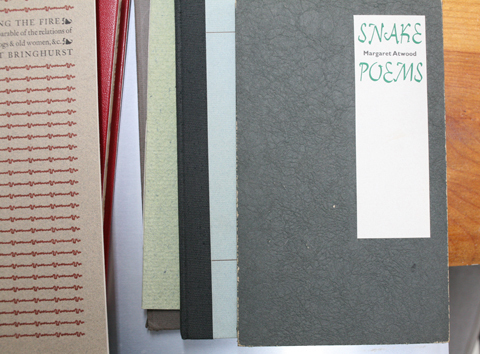 His studio was packed with typographical treasures. It was roughly divided in two sections: on one side stood presses and printing machines and lead type; on the other side, which was separated by a door salvaged from one of Toronto's tramways, was an office containing a computer, laser printer, and a lot of books. 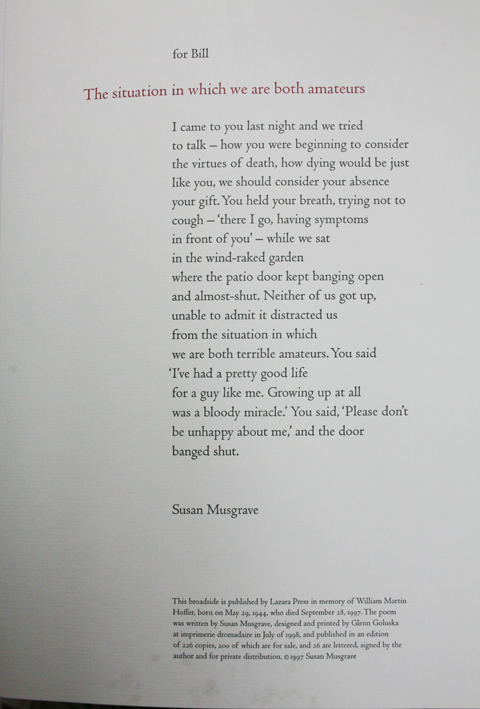 On one side the past, on the other the present. In between, the space was also crammed with a variety of bikes, which displayed his love for cycling. All of these items were acquired by Glenn over the years. He confided he often got very good deals for pretty amazing types, and books. 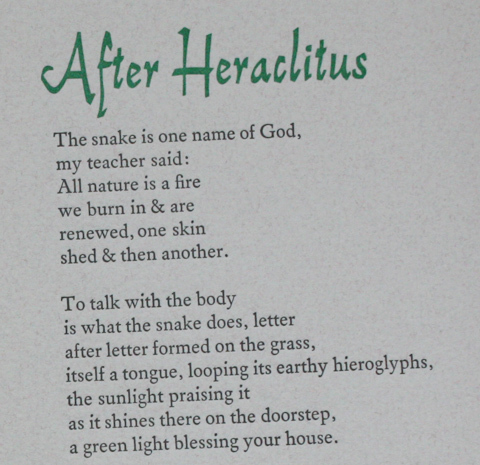 Originally from Chicago, he studied literature and languages in Toronto. He eventually began working in publishing, which initiated his career as a typographer. 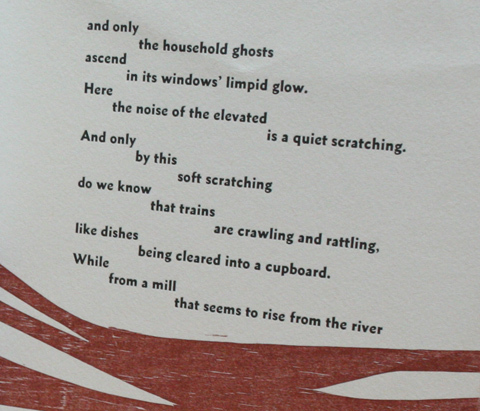 Later he moved to Montreal, where he was in-house designer at the Canadian Centre for Architecture in Montreal for ten years, and worked independently on books and artist's books, publishing under his own label: "imprimerie dromadaire". During my visit, he showed me recent and past projects of his, or projects that concerned him. He showed me, for example, recent proofs of a book he was currently working on. 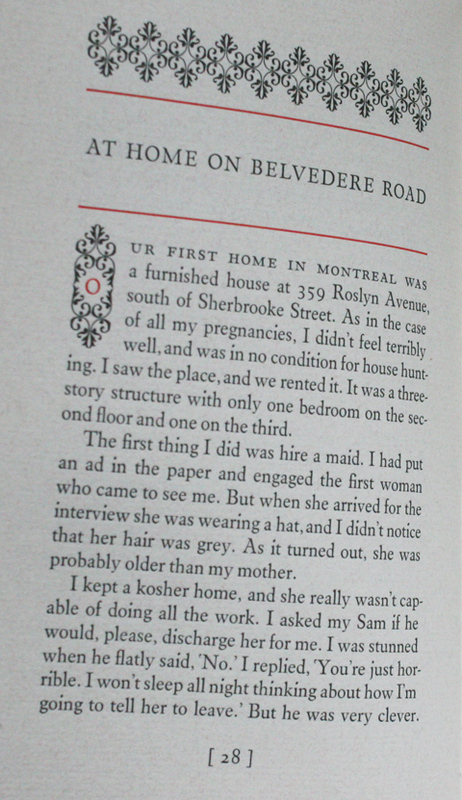 For this project, McGill-Queen's University Press had commissioned him to design both the interior and the cover of an upcoming publication. 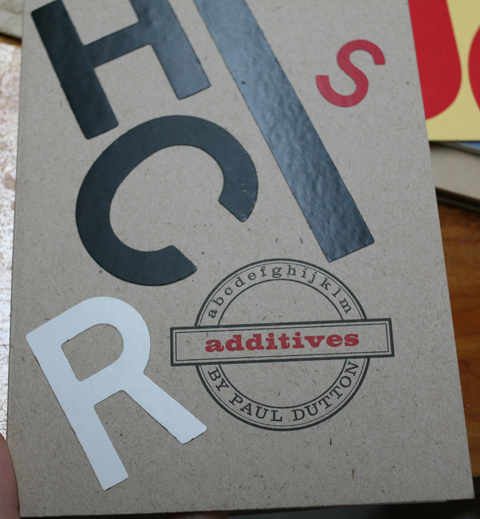 Furthermore, he also showed me a typeface design in progress, dedicated to him by type designer Rod McDonald. 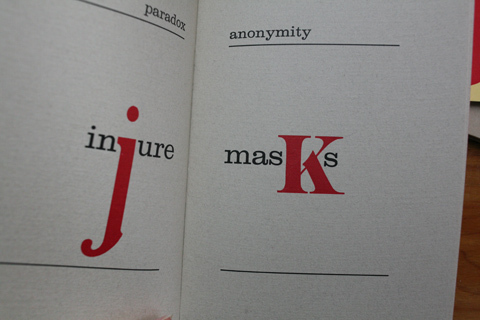 The latter based the design on Dwiggin's Elektra, because it is one of Glenn's favorites typefaces. 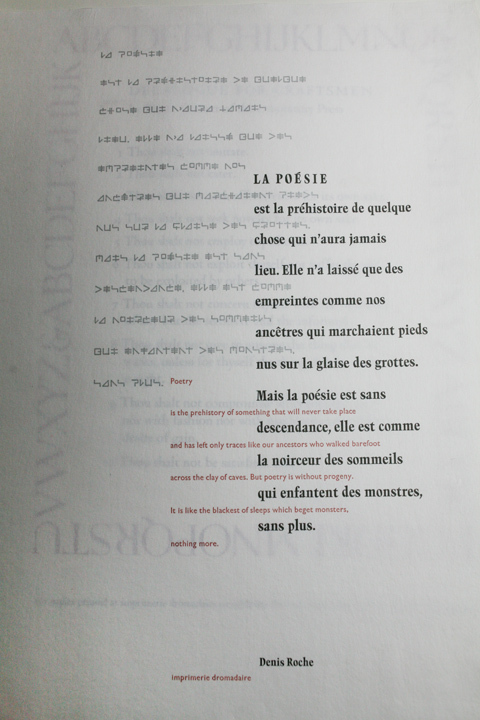 Additionally, the screensaver of his monitor showcased an event that had taken place in his studio in 2007, which was a letterpress workshop he had taught to UQAM graphic design students. We also looked together at the work of Robert Reis, a Canadian book designer who is today in his 80s, and whose work Glenn admires. 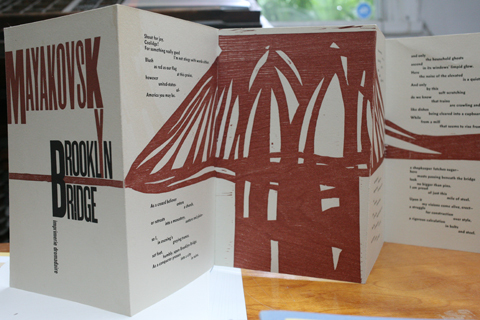 I saw a variety of artist's books and letterpress pieces he created. 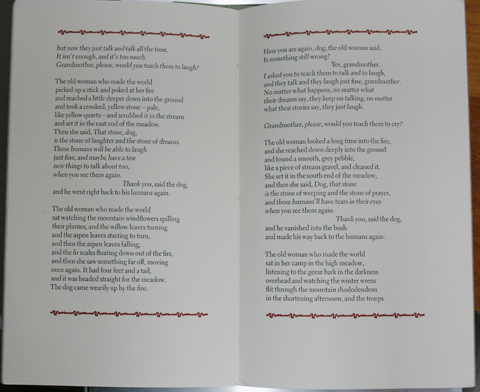 Letterpress printed sheet with poem by Musgrave. 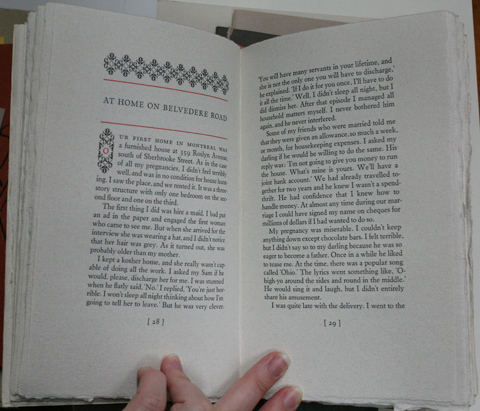 In comparison with his letterpress printed books, Glenn also showed me comparatively poor quality of a photo polymer print. The main difference is that the photo polymer shows a bit too much inking, especially when compared to the letterpress print. 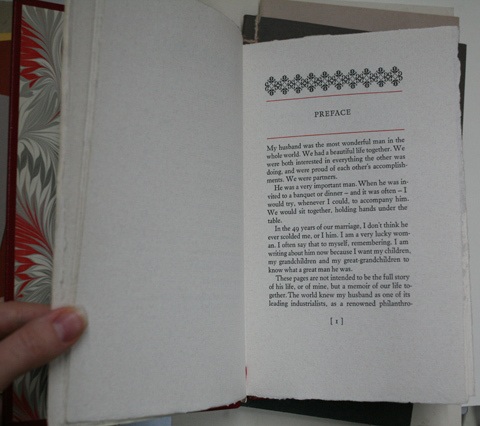 A privately commissioned book. 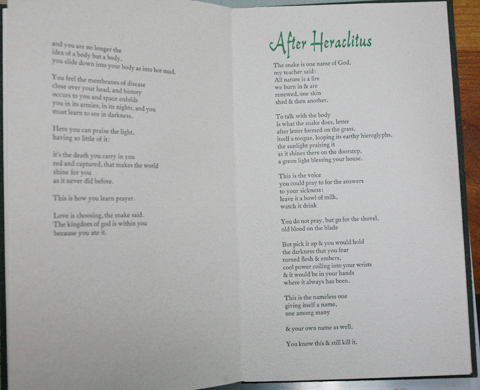 Glenn explained that the effect of letterpress is usually more visible on one side when printed recto-verso. Some people can even tell which side was printed first. 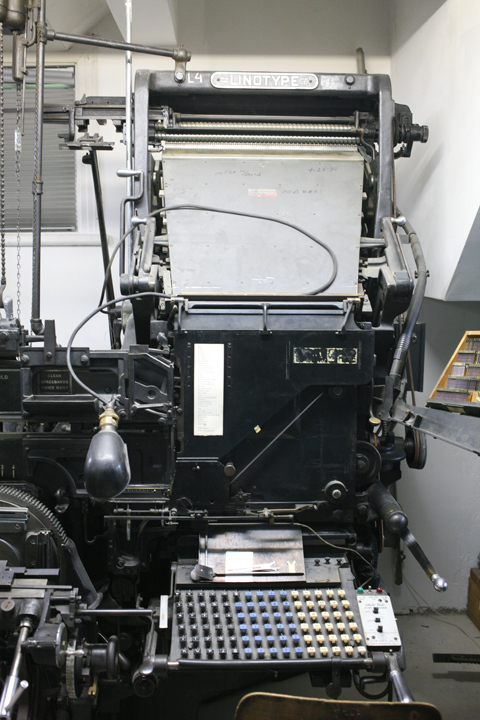 Glenn also showed and explained his work with the Linotype typesetting machine, which he used to use for many years. He pointed out its main advantage, which is to be able to set type without limits, and thus be able to hold enough letters for the composing of an entire book. 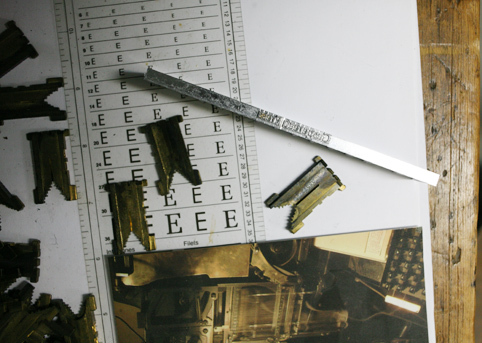 He also liked, that it facilitates the typesetting of very small type, which can be quite tedious when done by hand. Furthermore, there is no need to distribute letters back into the case or search for letters in the cases. Overall, the machine allows for greater speed than the previous hand compositing machines. During my visit, Glenn talked about arranging and organizing to give his entire collection and printshop to Gaspereau Press, a Canadian literary publisher and printshop, in Kentville, Nova Scotia, Canada. 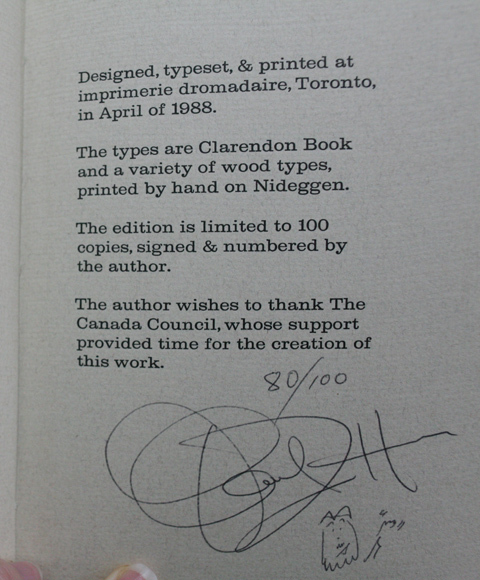 He has been friends with the Gaspereau Press folks, so he knew that his collection would be in good hands. Nice to know that one can follow up on Glenn's traces through this press. 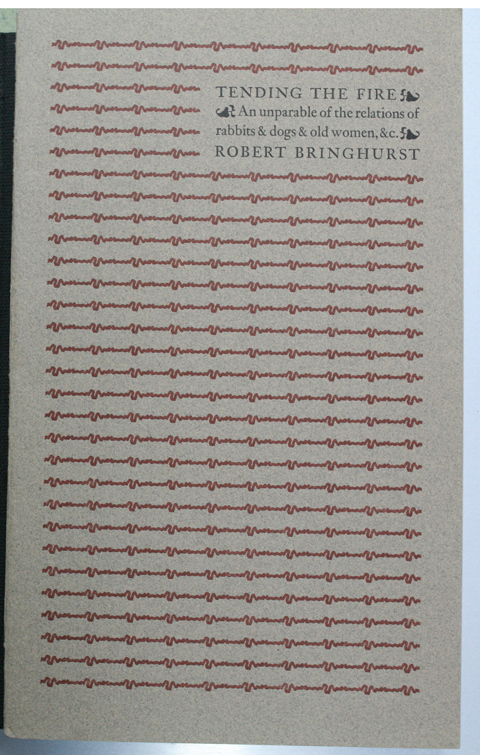 His dedication to preserve historic typesetting using letterpress and to be involved in contemporary computerized typesetting is invaluable. Although he is no longer with us, he persists through his work.